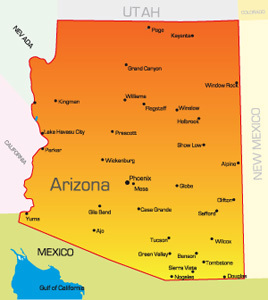 Arizona is the 15th most populous state in the United States with a population of over 6 million. The capital Phoenix has a population of nearly 1.5 million people alone making it a very good location for high traffic out-of-home advertisements. Arizona has a massive tourism industry because of several notable attractions like the Grand Canyon and ski resorts located in Flagstaff and Alpine. The highways that service the state also provide billboard possibilities and those are I-8, I-10, I-15, I-17, I-19, and I-40. Three notable universities in Arizona are Arizona State University, The University of Arizona, and Northern Arizona University. Together these schools are home to over 100,000 students.